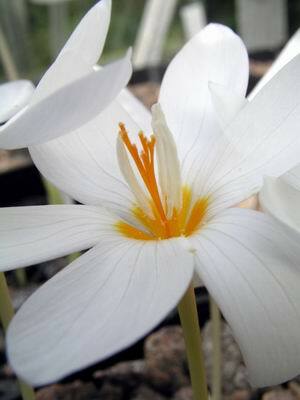 The larger species of colchicums are continuing with their cheery display. 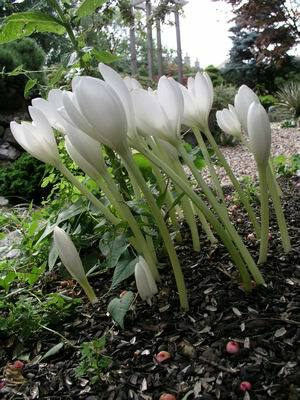 Colchicum speciosum album is one of the best and most sought after, this is no surprise when you see the superb display that a nice clump can make in the autumn garden. 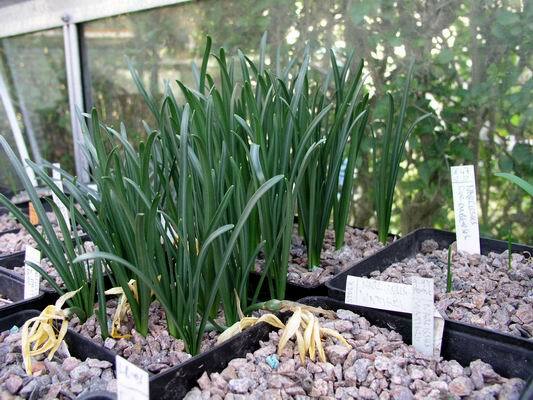 The job for this week is to give the bulbs under glass their second "storm", on the first of October. Although the surface of the plunge looks dry there is still some moisture below the surface and the bulbs have not dried out since the September storm four weeks ago. The procedure for the October storm is exactly the same as I described for the September storm - making sure that all the pots and the plunges are well soaked through. After the October storm our temperatures start to fall and the heat from the sun, even through the glass, reduces, so this water will not disperse as quickly as it did in September. My watering regime from now on is to ensure that the plunges remain moist plus watering the pots in proportion to the amount of leaf growth. You can see how quickly this pot of Sternbergia leaves has grown. This is the plant's major period of growth; it has had regular watering, especially on warm days, to help it produce the masses of cells in these leaves. If you do not give it water, it will use up the entire food source from the bulb which may, if it is kept too dry, break down into a cluster of small non-flowering bulbs - a typical reaction of true bulbs (Sternbergia, Narcissus, etc.) when they do not get enough water and food during this fast growth period. 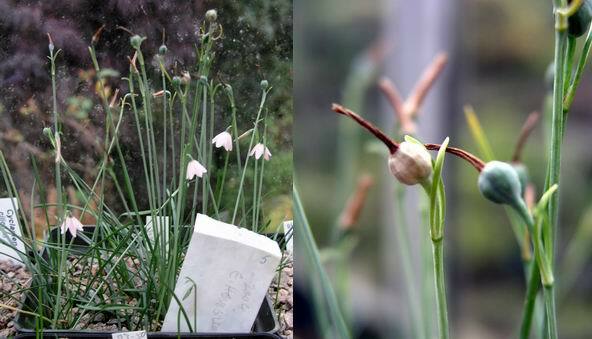 Crocus caspius has a large flower on a very short stem; it has just opened its first flower this week - the leaves are also appearing when it comes into flower. 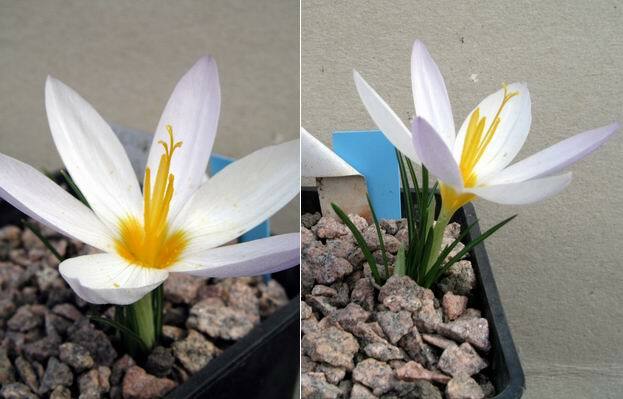 Crocus kotschyanus is flowering inside and out just now but it is under glass where we can really appreciate the beauty of the markings in the flower. To the right you can see that the flower shuts at night and when the weather is cool and dull, it is like us and prefers sunny warm conditions. 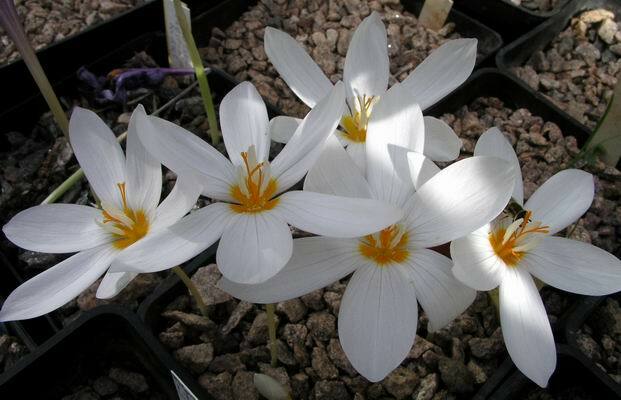 I showed this flower as Crocus boryi in the last log and those of you who visit the forum of the SRGC web site will have seen Tony Goode questioning the name C. boryi. I am still learning about Crocus and am very pleased to have an expert like Tony keeping a watching brief on me. Tony suggests that it could be a white form of C. pulchellus, as soon as the flowers are over, I will check the corm as he suggests as this could give me the answer. This gives a clearer view of the style which is branched quite far down. 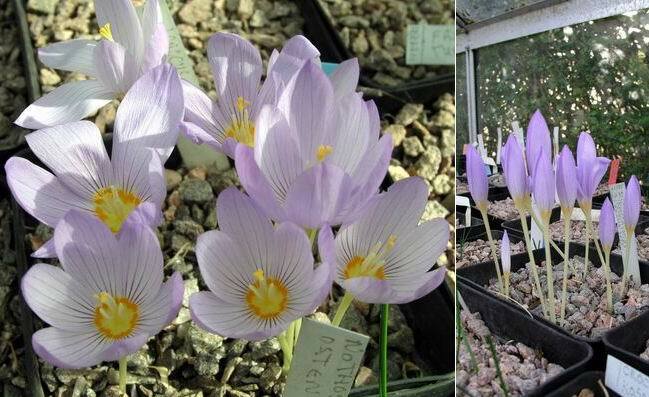 We have a number of crocus that we have raised from garden sourced seed that I have difficulty in keying out - I suspect that we are getting hybrids. 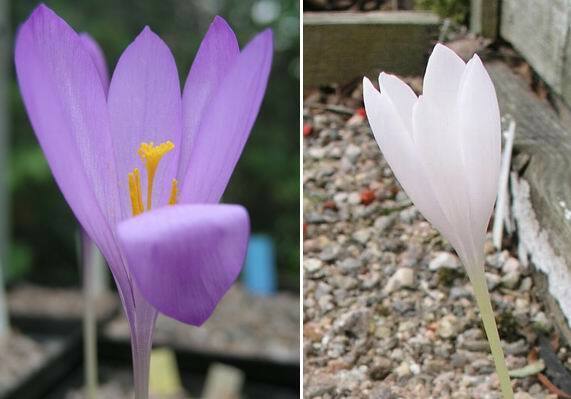 A few logs back I showed you a white form of Crocus nudiflorus called 'Orla' pictured on the above right - to the left is a flower raised from seed collected from C. 'Orla'. Our first batch of seedlings from 'Orla' are now flowering and so far three out of three have been purple so it does not look like the white gene is very dominant. I will keep seed from these seedlings and grow them on separately as sometimes the second generation will produce a higher percentage of whites. Leucojum roseum also featured on recent logs. 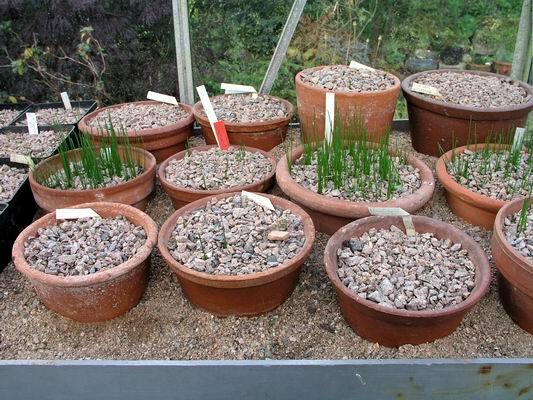 I have now collected and sown some seed within weeks of the first flower appearing. This tiny flower has to be among the quickest of the bulbs that we grow to make its seed; the seed of most autumn flowering bulbs does not ripen until mid to late spring or in the case of cyclamen, well into summer. 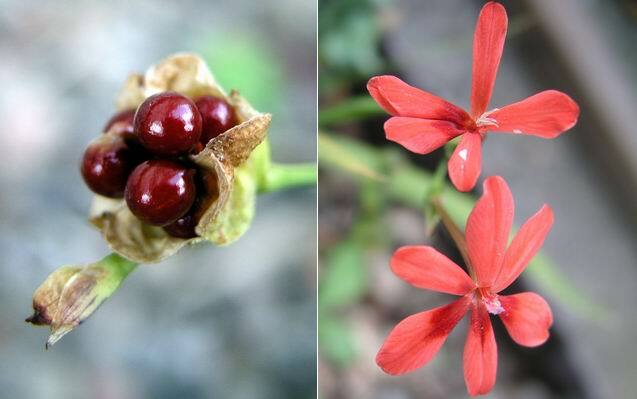 The small South African bulb Lapeirousia laxa is also setting seeds. These are very quick growing and I scatter them around a well drained outside bed where they will germinate and flower next year. The mature bulbs which are still flowering now are not long lived with us and may not be hardy in our winters. In the twenty years we have been growing Lapeirousia we have never been without its flowers, the bulbs have been sustained completely by self sowing.